Image by airbus777 licensed under Creative Commons. In our previous reporting, we wrote that the Rhode Island Avenue station would be shut down for 44 days “to allow a contractor to perform a large amount of work: replacing all the concrete ceiling tiles, track deck slabs, platform supports, track deck edges, and more.” Metro later announced that this shutdown is set to take 45 days from Saturday, July 21 to Monday, September 3. Some digging reveals that Metro is taking advantage of the closure to work on repairs that weren't adequately completed during a previous SafeTrack shutdown. The project Request for Information (RFI) which Metro posted back in January noted that the work would be done during “44 days for station shut down of actual construction,” which this author believed meant that Metro estimated the concrete replacement would take 44 days. But documents Metro made available to interested contractors indicates that the timeline is dictated by Metro’s own Track and Structures (TRST) department, which appears to require 44 days for unrelated track work around the station. The concrete contractor was given the 44-day timeline to complete their work. Location of precast ceiling panels which need to be replaced, as well as track girders. Image from Metro. In an emailed response, Metro stated that their crews would be “maximizing the work occurring during the shutdown” by completing other tasks. Picking up where the agency left off during SafeTrack, they plan to replace 4,000 linear feet of grout pads in and around the station to fix the level platforms. The station is currently not Americans with Disabilities Act (ADA)-compliant due to the gap between platforms and trains. Metro's plan to replace the grout pads in and around Rhode Island Ave station includes work on both tracks, extending hundreds of feet in both directions away from the station platform. Grout pads are the cement pads that the rails lay on. Metro replaced 5,737 linear feet of grout pads between NoMa-Gallaudet and Fort Totten during SafeTrack Surge 10 in late 2016, including most if not all in the Rhode Island Avenue vicinity. This latest round of work includes raising the tracks themselves — likely by installing larger grout pads — by one inch, to return the station to ADA compatibility. As of July 2017 at the end of SafeTrack, Metro had a draft specification for testing grout pad concrete, but had not yet implemented a testing program. In addition, Metro says they plan to replace two switches which connect Brentwood Yard to the main set of Red Line tracks. The closure also gives DDOT extra time to perform their work reconstructing the Monroe Street Bridge, which can’t be done while trains are running underneath. While TRST does their work, Metro’s contractor will have their work cut out for them. The location of the concrete work that Metro says needs to be done isn’t just limited to the ceiling, from which small chunks fell twice back in 2016. In addition to replacing the ceiling panels, the contractor will need to perform “spall repair” — that is, fix sections where concrete is flaking off or loosening due to water entering or other internal pressure. “Typical” concrete spalling at the top of piers supporting the Red Line tracks near Rhode Island Ave. Image from Metro. 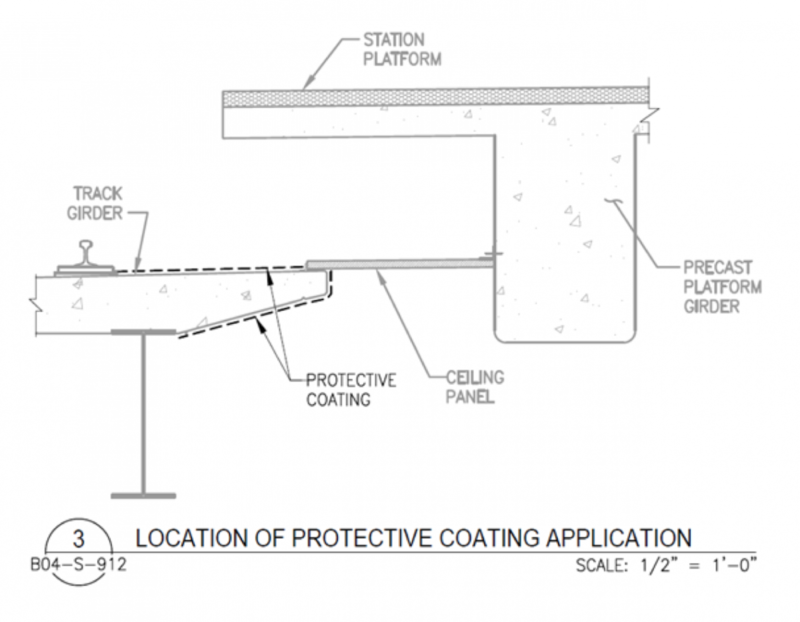 The location of some of the spalling (not all; Metro’s presentation notes “several spots”) is on the tops of two of the beams which support the Red Line tracks over Rhode Island Avenue, meaning that the tracks supported by these bearings would need to be jacked up to perform repairs. Trains would not be able to run over the tracks while this work is performed. In addition to the Rhode Island shutdown from July 21 to September 3, Metro has three other major projects this year including those affecting the Blue, Orange, Silver, and Yellow lines.